Let’s start a campaign to officially call Tottenham Court Road TCR! That would solve the problem because it would take up less space and thus enabling the kink in the Victoria line to be removed, if only to ease whistlekiller2000’s OCD! How does this look, in terms of Thamesmead extensions? I've dared go no further than Thamesmead since the Transport Strategy doesn't mention anything further (so no Abbey Wood or Woolwich). 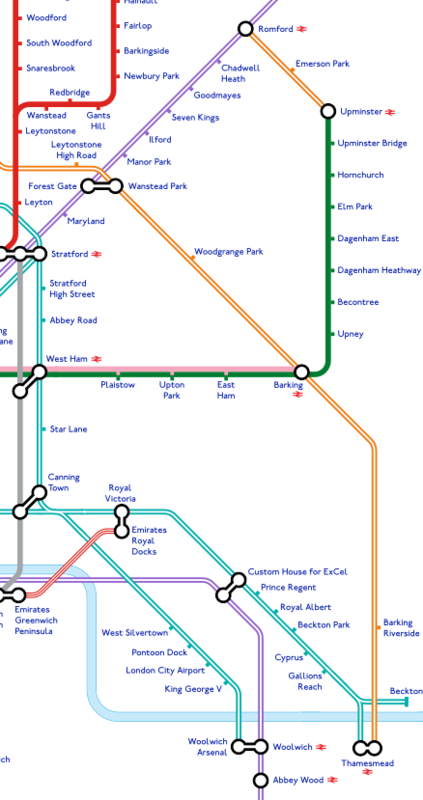 The District Line now has a 90 degree bend, but at least it's slightly more geographically accurate as far as Barking. I think I'd prefer (or at least I'd like to see how it looks) with the district making the turn in two stages (i.e. with a diagonal stretch). Perhaps between Upton Park and East Ham to somewhere around the Dagenhams. Although this would move Barking and Barking Riverside further apart, this could be slightly mitigated by having the river run diagonally upwards east of Woolwich (which it does in reality). I like the way the DLR splits however, should Thamesmead recieve a NR logo? Won't it only have overground and DLR. I'll see if I can get this cooked up for you. I've generally been following the philosophy that the fewer bends, the better: this is part of the reason why I removed the kink in the Northern line between Warren Street and Euston, and also why I removed the bends in the North London line and Goblin. I think one of Max Roberts's lectures on transit map design cites a study saying that one of the biggest factors which makes it harder to comprehend transit maps quickly is the number of bends - but perhaps a single 90 degree bend is no better than two 45 degree bends! Another proposal might be to bend the Elizabeth line directly east after (say) Forest Gate: this might mean that the District line wouldn't ever have to go vertical, and again would probably be more accurate than the Elizabeth line going at 45 degrees. But then horizontal lines always have the problem that it's harder to squeeze labels in. I will have a go at bending the Thames as well. Re Crossrail2. I didn't read it was calling at Warren St, and also it is a double ended connection to Euston and KX (rather than 2 separate stops as the map indicates). Are you looking at the same map as me? Or have you confused the Victoria Line with CR2? 侵略! S系, でゲソ! The Tube comes from the bottom of London! 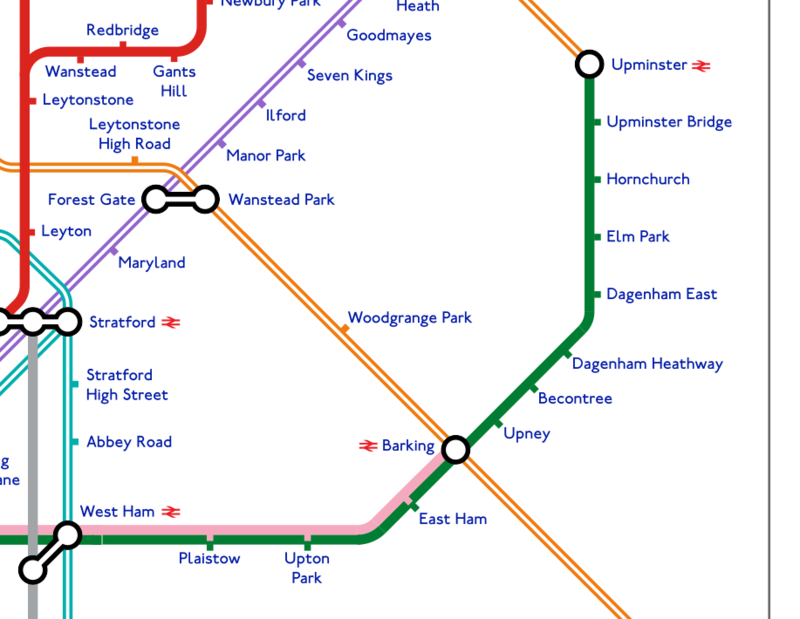 The western Northern line will likely have its own name: the most rational option in my opinion is the lilac-coloured Hampstead line, after the Hampstead Tube. The eastern one would likely keep the old name for ease of recognition. "Take any train: when is the "any" train coming?" Batterware Line? I’m sure whistlekiller2000 would approve of that! Maybe the Power Line, in view of its new southern terminus? However, I thought all new line names now have to have royal associations (Victoria, Jubilee, Elizabeth.....) It was a missed opportunity when the H&C was not called the Regency Line, passing as it does Nash Crescent, Regents Park, etc. 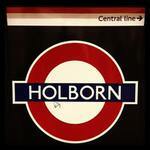 Given its close association with the Victoria Line, maybe the Albert Line? Or, name it after Princess Charlotte, as the first female in the line of succession - the Lottie Line would go quite well with the Lizzie Line! It would cost a fortune to change the name of that section of the Northern line. It's not as simple in real life as just changing the colour and name on the map. If it is split, I think the money will have to be spent - it would make no sense to have two separate lines with the same name and colour. Renaming stretches of line is nothing new - see the Hammersnmith & City (split from the Met, although it's not a complete split as they share tracks for some distance), or the renaming of the Hammersmith branch as joint H&C/Circle. In 1979 the Bakerloo was split when a short new branch was added - a close analogy with what is about to happen at Kennington. I was just admiring your map and noticed that Clapton and St James Street are switched (apologies if that was already pointed out). It's great work - you've inspired me to start looking at Inkscape again. Thanks for spotting this - and I'm glad you liked the map! With interchanges like Euston Square SSR - Euston Tube - CR2 - Kings Cross Tube - Kings Cross SSR, pretty soon we'll be able to walk around the entire system without needing to get on a train at all! Great diagram though, well done!